Natural Flavors, Organic Guar Gum, Erythritol, Mannitol, Acacia, Vegetable Juice Color, Silicon Dioxide, Soy Lecithin, And Soybean Oil. Contains no yeast, wheat, gluten, corn, artificial flavoring, or preservatives. All colors used are from natural sources. Each morning, mix one level scoop (18g) with 8 to 12 ounces of water, your favorite beverage, smoothie, or yogurt. Drink within 30 minutes of preparation. Natural flavors, erythritol, organic guar gum, mannitol, acacia, citric acid, silicon dioxide, soy lecithin, and soybean oil. 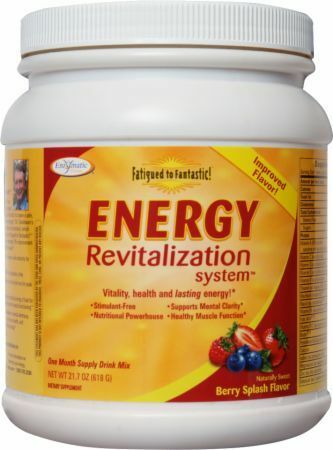 Energy Revitalization System comes with a free 30 day supply of Daily Energy B Complex. Daily Energy B Complex features essential B vitamins and choline to support endurance and energy, and help maintain mental alertness when experiencing fatigue. * B vitamins are water soluble and must be replenished daily for the body to operate at peak energy. This ultimate-strength formula contains the B vitamin complex necessary for healthy function of blood, brain, and nerve cells which are vital for sustained energy. * This formula was designed with Jacob Teitelbaum M.D., recognized fatigue expert and author of From Fatigued to Fantastic!